What is being described as a mini-tornado has left fences toppled, and sent trees and roof tiles flying in the northern Perth suburb of Karrinyup. Imagery captured by Bureau of Meteorology radar and satellites showed powerful winds tearing through Perth around 6 a.m. Saturday but could not definitively say it was a tornado. 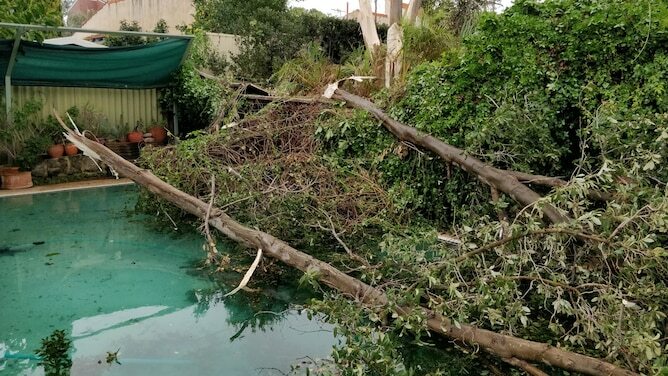 One local resident from Summerhayes Drive said he was woken up by the sound of his neighbor's tree being torn in half before crashing their fence and landing in his pool. The extreme winds also took off portions of his own roof along with many tiles and other debris. Another local resident named Jacqui Lockhurst said she heard a massive bang followed by a flash of light after a power line came down. "A bunch of tiles were blown off our roof and some of them smashed my partner's ute which was parked in our driveway," Lockhurst said. Yet another resident named Carl Boterhoven said his double brick fence was completely blown over. A trampoline in his backyard was also destroyed after being blown onto his neighbor's roof. There were 13 requests for emergency help in Karrinyup which Stirling State Emergency Services volunteers responded to. Local businessman Doug Cooper said one row of homes on Summerhayes Drive took the brunt of the natural assault. "We’ve mostly been dealing with roof damage from the wind itself and branches from trees that have been blown onto roofs," Cooper said. The mini-tornado took down power for 90 homes in the area and some are still being restored. Perth is also seeing high levels of rain for this time of year with just five days into August bringing 68mm of rain, over half of the 123.6mm monthly average.